The month of November is often seen by the world as a month of thankfulness. But, I find it amusing and sad that being thankful isn't thought of as an everyday thing. But, then I remember my own dark heart. How easily I forget to say thanks to the One who has given the Most. 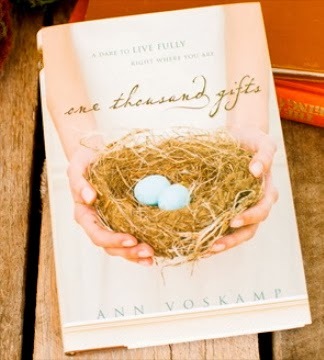 I'm reading Ann Voskamp's book, One Thousand Gifts, right now. I really don't know why I haven't read it before now. I know practically everyone else has. I really like the way she blends together our need to thank God on a daily basis, with having real and lasting joy in our lives, even through the valleys, storms and darkness. Grace, thanksgiving and joy are intimately intertwined. Eucharisteo. Greek; Thanksgiving. In the New Testament Paul writes to the church at Philippi, encouraging them to be thankful, but explaining that it is a learning process. I love that we continue to learn how to live here on Earth in preparation for our life with God in eternity... only for His glory, not our own. This is one of my favorite scriptures, Philippians 4:12-13. "I know both how to have a little, and I know how to have a lot. In any and all circumstances I have learned the secret of being content—whether well fed or hungry, whether in abundance or in need. I am able to do all things through Him who strengthens me." 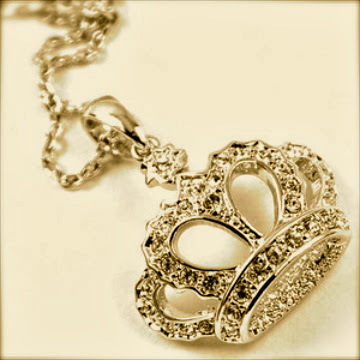 I have a huge, bling-y crown pendant I frequently wear. (I like large, sparkly stuff.) Some one asked if I thought I was The Queen. Not being glib or sassy, I replied that No, I didn't, but I am a daughter of The Most High King. It is His crown I wear. Its not about me. I'm trying really hard to show that to others every second, with every word and every deed. Apart from Him, we are derelict, bereft, shattered. Lord, help me to live up to my own declaration every single day. Help me to learn to give more thanks, find more joy and extend more grace. Amen and amen.